(RMS Continuous Power). Heat Sink Type. Channel Separation. Cast aluminum. Number of Channels. Input Sensitivity. Circuit Topology Class. Rated Power. 250 Watts RMS. (RMS Continuous Power). (Sum of Rated Power). Number of Channels. Circuit Topology Class. Front Channels. Rear Channels. Low Level: 2 RCA Pair. MFR # R500X1D. 300 watts RMS x 1 at 4 ohms (500 watts RMS x 1 at 2 ohms). mono subwoofer amplifier. Class-D amplifier design. phase switch. variable low-pass filter (50-250 Hz, 12 dB/octave). variable bass boost (0-12 dB at 45 Hz). 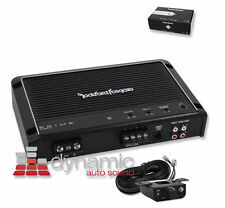 New ListingRockford Fosgate Power 1000bd Old School, Class D Vintage Amplifier. Rockford Fosgate Power 1000bd . Condition is Used. Rockford Fosgate Punch Series P300X2. Featuring One of Rockford Fosgate's Latest Proprietary Technology, C.L.E.A.N. set-up. 300 Watts RMS, 2 Channel Class AB Amplifier. 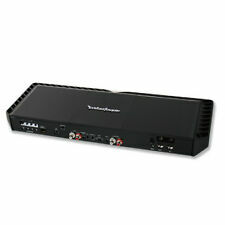 Punch Series 2-Channel Class AB Car Amplifier. 1500 Watts RMS. 1500 Watts x 1 @ 2-Ohm. 1500 Watts x 1 @ 1-Ohm. Circuit Topology Class. Total Power. (Sum of Rated Power). Rated Power. (RMS Continuous Power). Rockford Fosgate R500X1D. 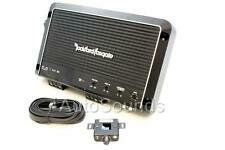 The Rockford Fosgate R500X1D is a quality made Mono D car amplifier that is rated at 500 Watt x 1 Channel @ 2 Ohms RMS. You can use the low-pass filter and Rockford Fosgate's famous Punch boost to get the best possible bass from the sub and enclosure in your vehicle. Mono subwoofer amplifier. Class-D amplifier design. Sound of Tri-State has the sole discretion as to what is warrantied. 11"W x 2-"H x 6-3/4"D. variable low-pass filter (50-250 Hz, 12 dB/octave). The amp is in great working order. Some average scuffs and scrapes from use. Fully functional. ​Please see photos for further detail. Includes everything showed in pictures. If something is not clear please contact us. ​Feel free to ask any questions. 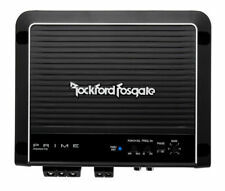 Rockford Fosgate R1200-1D 1-Channel Car Amp PRIME!!! LAST ONE!! Rockford Fosgate R1200-1D 1-Channel Car Amp. Shipped with USPS Priority Mail. The iconic 1200 watt one channel by fosgste. Includes a low level pass thru! Don't let it slip away!! Last one!! 5 out of 5 stars - Rockford Fosgate R1200-1D 1-Channel Car Amp PRIME!!! LAST ONE!! 86 product ratings86 product ratings - Rockford Fosgate R1200-1D 1-Channel Car Amp PRIME!!! LAST ONE!! This Rockford Fosgate R1200-1D 1-Channel 1200W RMS Car Amp Amplifier is in used working condition and shows wear from normal use. Washinton state and Minnesota. 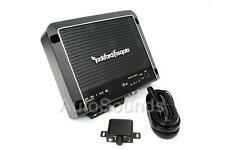 Rockford Fosgate R500-1D 1-Channel Car Amp. Condition is New. Shipped with USPS Priority Mail. Check out theRockford Fosgate R500X1D Owner's Manual. 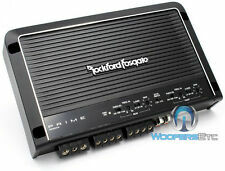 Get a matching Rockford Fosgate wiring kit for your new Rockford amplifier! 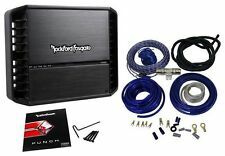 Rockford Fosgate RFK4X 4 Gauge Amp Kit. Rockford Fosgate. 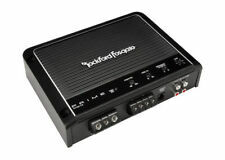 Rockford Fosgate RFC1D - Top of the Line 1 Farad. It just needs to be re-threaded. It works fine though. Very good used working condition. Has a few scuffs. Seals are intact. This amp was tested and works great. Item Code: PBR300X1. RMS Power Handling Total Power (Sum of RMs Power): 300 Watts. Ultra compact chassis. Circuit Topology Class: Class BR. 300 Watts x 1 @ 1-Ohm. Number of Channels: 1. If the item you chose is more or less money we will work out the price difference with you. The P300X1 is perfect for use as a dedicated subwoofer or center channel amplifier. On-board Punch EQ with 18dB boost @ 45Hz. Number of Channels. High level input capable with Auto Turn-On circuit. Muted turn on. Punch BD Series Monoblock Class BD Car Amplifier. On-board Punch EQ with 18dB boost @ 45Hz. w/ input/output clip detection and indicator LEDs. Optional remote PLC2 ready (w/ input clip indicator). 1 ohm: 500 watts x 1 chan. BY ROCKFORD FOSGATE L-11000D. 2,000 WATT CLASS-D MONO AMPLIFIER. Signal Input Low-Level: 2 RCA (150mV to 4V). 500 Watts RMS x 1 @ 2-Ohms. Max Power 500 Watts RMS x 1 @ 4-Ohms. 1000 Watts RMS x 1 @ 1-Ohm. Trending at $174.88eBay determines this price through a machine learned model of the product's sale prices within the last 90 days. CEA-2006 compliant amplifier. 0°/180° Phase Switch. Damping Factor: >200 dB. 2 ohms: 500 watts x 1 chan. Over current protection. Frequency Response: 20 - 250 Hz /- 1 dB. Signal to Noise Ratio: >100 dB. (Sum of Rated Power). 250 Watts RMS. 250 Watts x 1 @ 2-Ohm. Low Level: 1 RCA pair. Circuit Topology Class. Number of Channels. (not included). 9 - 16 VDC. CEA-2006 compliant amplifier. Frequency response: 20-250 Hz. Damping factor: >200. Infrasonic filter (15-40 Hz, 12 dB/octave). Variable low-pass filter (50-250 Hz, 12 dB/octave). Low level: 150mV-5V. Input sensitivity. Rockford Fosgate FRCT750X1BD. Rigid, Smittybilt, ARB, Westin and hundreds more! The Power T750X1bd is an ultra-compact, Class bd 750 Watt mono amplifier. Perfect for hybrid, electric, small cars, trucks, motorcycles, and side-by-side UTVsProduct Highlights. 75 watts RMS x 1 at 4 ohms (150 watts RMS x 1 at 2 ohms). 300 watts RMS x 1 at 1 ohm. mono subwoofer amplifier. differential-balanced inputs eliminate noise from your vehicle's electrical system. 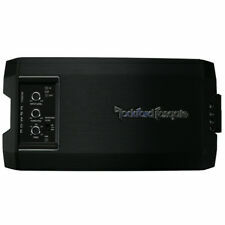 Rockford Fosgate Punch P300X1 MonoBlock Car Amplifier 1 Channel Audio 300 Watt. 750x1 @ 1 ohm. Infrasonic Filter 12dB/oct @ 15-40Hz. Monoblock channel operation. 2-Way System Protection circuitry. CEA-2006 compliant amplifier. Frequency response: 20-250 Hz. Infrasonic filter (15-40 Hz). Variable high-pass filter (50-250 Hz, 12 dB/octave). 1 ohm: 750 watts x 1 chan. 3-way protection circuitry (thermal, overload, and speaker short protection). Class-D Full Range 1-Ohm Stable Monoblock Amplifier. Variable Bass Boost: 0 to 18 dB bass boost at 45 Hz. Mono subwoofer amplifier. Class-D amplifier design. variable low-pass filter (50-250 Hz, 12 dB/octave). variable subsonic filter (15-40 Hz, 12 dB/octave). warranty: 1 year. P1000X1BD - Rockford Fosgate Monoblock 1000W RMS 2000W Max Punch Series Amplifier. Punch BD Series Monoblock Class BD Car Amplifier. Monoblock channel operation. Ultra efficient Class BD circuitry to maximize amplifier power efficiency. CEA-2006 compliant amplifier. 0°/180° Phase Switch. Damping Factor: >200 dB. Cast aluminum heatsink. 2 ohms: 500 watts x 1 chan. Muted turn on. Frequency Response: 20 - 250 Hz /- 1 dB. Signal to Noise Ratio: >100 dB. Rockford Fosgate PUNCH Series P400X1. Featuring One of Rockford Fosgate's Latest Proprietary Technology, C.L.E.A.N. set-up. 400 Watts RMS, Monoblock Class AB Subwoofer Amplifier. Punch Series Monoblock Class AB Car Amplifier. Due to its dedicated low frequency response, this amplifier is optimized for mid-bass speakers or subwoofers only. On-board Punch EQ with 18dB boost @ 45Hz. (Sum of Rated Power). Number of Channels. With the right mono channel amplifier at your disposal, you can give your subwoofer the power to belt out a capella music on your way to work or to produce deep techno beats while you cruise with your friends. Rockford Fosgate offers many different models of amplifiers, and each type is manufactured with the explicit purpose in mind of producing audio that will sweep you off your feet. How many mono amp models does Rockford Fosgate produce? Power series: This high-end collection from this company can handle the highest number of watts. Devices in the Power series can process up to 2,500 watts, and they use four AWG speaker wire. They also have RCA pass-through outputs. Punch series: The Punch series is the midrange option from Rockford Fosgate. The mono devices in this series can handle up to 1,000 watts, and they come with remote controls. They are muted when they turn on, which removes any potential for screeching feedback. 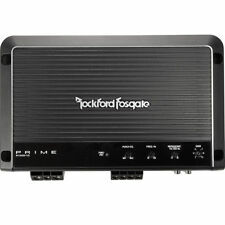 Prime series: Models in the Prime series represent the entry-level offerings from Rockford Fosgate. They can process up to 800 watts and most options in this series feature RCA pass-throughs. How do you choose from among these models? In general, these different models are designed to be directly compatible with Rockford Fosgate subwoofers of the same name. For instance, Power series amps are designed to work with Power series woofers. However, it's definitely possible to use these devices with other woofers if you simply observe the wattage rating of the amplifier. If your woofer takes up 1,000 peak watts, a 1,000-watt Power series amp is a good choice. However, if your woofer only takes up 500 watts, the same amp would be overkill. Conversely, you don't want to use an amplifier that is rated under the peak wattage rating of your woofer. How do you install a Rockford Fosgate mono amp? Step 1: Disconnect the battery before working on anything associated with your vehicle's electrical system. Step 2: Connect your amp to your subwoofers with speaker wire. Step 3: Run speaker wire from the amp to the car stereo. Connect the wire to correct positive and negative terminals on the audio device. Step 4: Reconnect the vehicle's battery. Turn on the stereo, and then turn on the amplifier. Manipulate the controls on the amp until you've achieved audio levels that are to your liking. Content provided for informational purposes only. eBay is not affiliated with or endorsed by Rockford Fosgate.